We are all hunkering down and praying that Hurricane Ike will weaken in the gulf and pass us all quickly with little to no destruction. We are in the NW part of Houston and shouldn't experience too much other than high winds and some power outages. We have stocked up on water, propane, flash lights, food, ice, etc. and are feeling prepared to "rough it" for a couple of days if we have to. If the power outages last longer, we'll go and stay with friends. Most of Chris's family is from Galveston Island so we're praying for their safety and the safety of their homes. His Memaw & Pepaw live just a couple of blocks from the beach, behind the Seawall on the east end of Galveston. They have decided to stay and wait it out. This makes us nervous but all we can do is to pray and wait. We will be praying for you as well. Hope you and your family will remain safe and sound. Downstairs I hear my brother-in-law moving the outside stuff in - and I am still surfing the net before the winds begin. Covering your family with prayer Chris-those in Galveston and you, Mari and kiddos too. Definitely a time for much prayer, and relying on a mighty God. Much love to you all. Sorry Ike is heading for yall. Gustav was a real pain in the neck! I will be praying for you and especially MeMaw and PawPaw...that make me very nervous since I have been watching the weather channel and they have a meteorologist in Galveston! Keep us posted when you can. 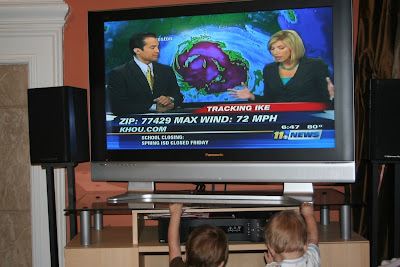 Mari, we will praying for all of your family while we wait for Ike here in North Texas. Stay safe! I live near Corpus Christi so we have prepared as well but as you know Ike turned toward ya'll. Let us know how you are after the storm. i hope you all are able to weather the storm safely, i will be thinking of you and keeping you in my prayers! Hoping and praying for you guys! Oh gosh Mari! I pray for the safety of Chris' parents. There truly is no way of know what destruction Ike is capable of, until he has come and gone. Hunker down. You've captured historical pictures on your TV there. What timing! Praying for your family too! We are praying for you guys and Chris's family. I've got an award for you on my blog. We'll alll be anxiously waiting for your next update to make sure all is well. My brother just moved to houston a month ago, so i hope he knows all the necessary precautions to make. We getting flooding here in MO, but no hurricanes. Of course the rain from Ike is supossed to cause us some pretty good flooding here over the weekend. Crazy that it impacts that far north. 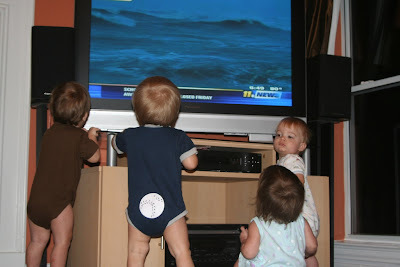 Keep those kiddos safe, and hopefully enough power to help keep them occupied! Didn't they see the expert warning about "certain death". People need to LISTEN TO THE EXPERTS. I don't feel bad for people who stay. UPDATE: My grandparents packed up some things and left their home about an hour ago. Thank you all for your thoughts and prayers. We pray for their safe trip off of the island. Was wondering about your grandparents. You have said before that they don't leave and they usually stay to weather out "storms". I am so happy to hear they heeded the warnings and left!! Stay safe! Checking on everyone again-such praise that your grandparents packed up to leave. Will continue to pray for safe shelter for all. Here it is still the calm, but watching the reports shows such the opposite on the coast already. Hang in there and stay safe. My grandparents evacuated from Pasadena to DFW late last night. Will be thinking of all of you and praying. Wishing and praying for the best from Minnesota here! Hang in there all of you! Came to your site from "So Much To Seay". Congratulations on your blog award. Our family will keep you in our prayers while IKE passes. We are watching on TV! Thank God they left the island. I pray they got off all day. Been watching all day. Looks like Galveston just lost electricity. Praying for you all! I'm glad your grandparents got off the island. If ya'll need a place to escape too, we're up here in Plano, and the place is quad-proof! HOpe ya'll stay safe and keep electricity! The Graf Quads have been thinking about you and saying extra prayers for their Houston Quad buddies all day. Hope everything is alright. Feel free to pull a "Tubre" and have someone update the blog when the dust (or mud) settles. I'm sure any of your quad sistas would be more than happy to help you out (myself included). Are you guys okay? Have you heard from Chris' family? Praying that you family is safe!! praying for you! stay safe you guys!! Please keep the updates coming!